Line 2 large baking sheets with parchment paper. Cut each tomato in half, place cut side up making one layer on baking sheets. 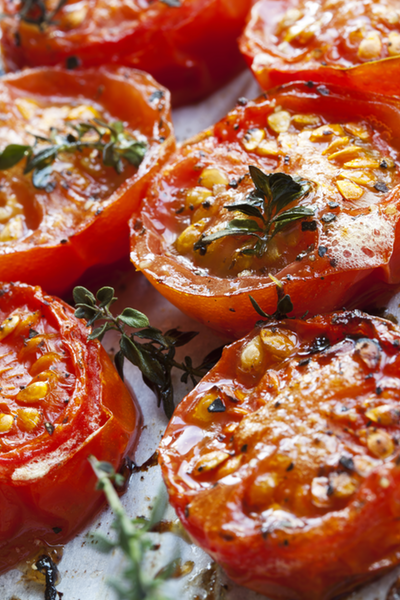 Drizzle the tomatoes with 1 tbsp of the Meyer lemon olive oil and sprinkle with salt. Roast until tomatoes are dried around the edges but still moist, about 2 hrs. Cook pasta, reserve 1 cup of the pasta water for later use. Drain pasta, return to pot add tomatoes, goat cheese, basil, reserved pasta water and remaining 2 tablespoons of Meyer lemon olive oil. Toss well and season with salt and pepper.